Veteran Malayalam actor Thilakan passed away following a cardiac arrest, at 3 am on 24th September 2012. He was 74. 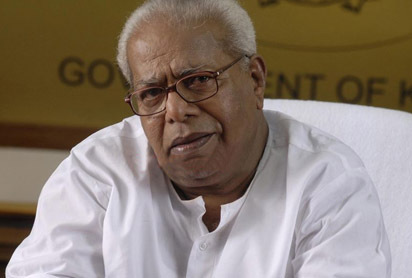 Thilakan was admitted due to serious illness since August 23. He had played various roles in about 300 films in different langauges. He is survived by two sons and two daughters. Thilakan had been struggling ever since he was admitted on August 23. He also suffered from an attack of pneumonia. Thilakan made his debut in cinema in 1972 with ‘Periyar’. But it was with K.G. George’s Kolangal (1981) that he truly rose to fame. From the beginning of his film career to the recent ‘Ustad Hotel’ Surendranath Thilakan remained an actor beyond comparison. Actually his passion for acting began while he was still at school. The acting career was started in the 1950s in popular dramas. Many awards and recognitions were won by him. He won the Best Supporting Actor award for his role in ‘Rithubhedam’ in the year 1988. Thilakan's performance in ‘Perumthachan’ fetched him the Best Actor award by the Kerala State govt. in 1990. In 1994, he once again won the State Best Actor award for his movies ‘Gamanam’ and ‘Santhanagopalam’. He won Special Jury Award for his performance in ‘Ekantham’ in 2007. Thilakan was awarded the Padma Shri in 2009 for his contributions towards arts. Thilakan was born at Ayroor, now in Pathanamthitta district, on July 15, 1938.